So I’m not a big fan of healthy dessert recipes. I told you that in one of last week’s posts right? That post on keeping healthy and all… You see, in my opinion, healthy desserts are either yucky or not really that healthy at all if you look over the ingredient list. However, if a dessert that is absolutely and utterly delicious just so happens to be healthy too, how can anyone, including myself, possibly have a problem with it? I mean, how can you hate something that is both yummy and good for you? As in, less than 100 calories per serving kind of good for you? You can’t! It’s impossible! This delicious, amazing fruit mousse is not only low in calories and fat free, it also happens to be everything you could ever hope for in a fruit dessert. 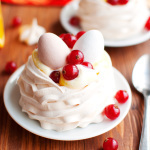 It’s super light and fluffy, like a soft sweet cloud, and packed with bright summery flavors. 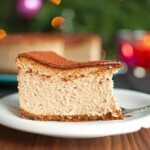 Better yet, this recipe is incredibly versatile! Not only can you use whatever kind of fruit you like – try it with mango and passion fruit – you can add as much (or as little?) sugar as you like. 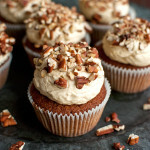 Heck, you can even use honey or maple syrup, or even stevia, if you must! 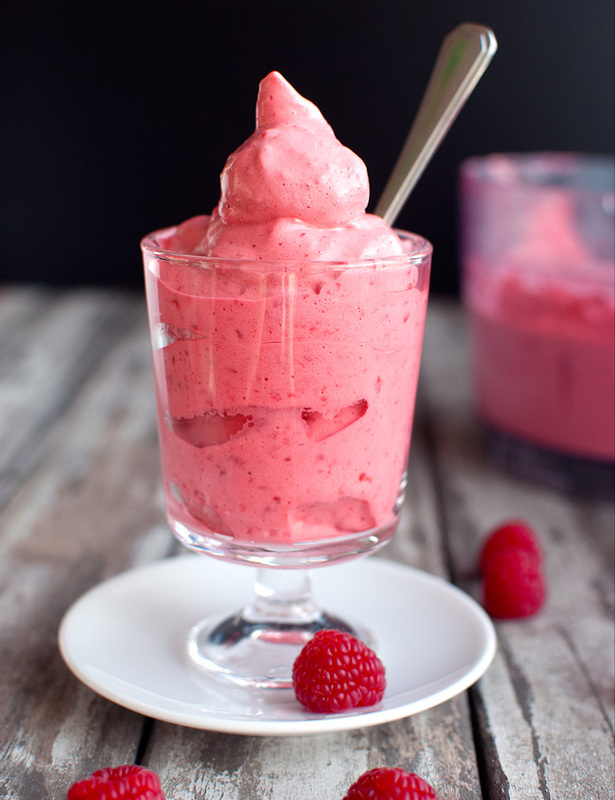 This recipe only calls for three ingredients: frozen fruit, sugar and an egg white. 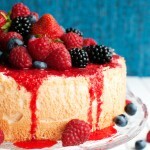 The fruit is obviously what makes this mousse taste like summer. 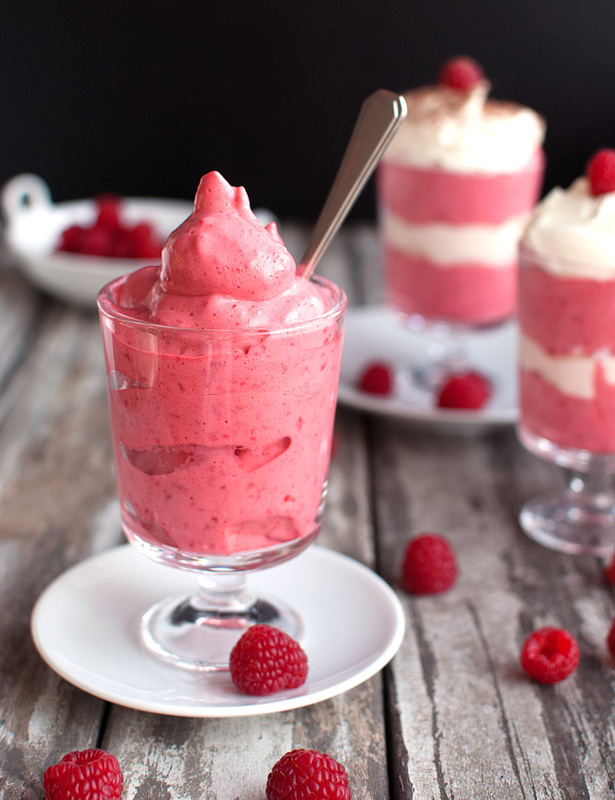 The sweeter the fruit, the better the mousse. Duh! So far, I’ve mostly tried summer berries and tropical fruits, but you can also use frozen canned peaches or pears. I bet it’s great with pineapple too! 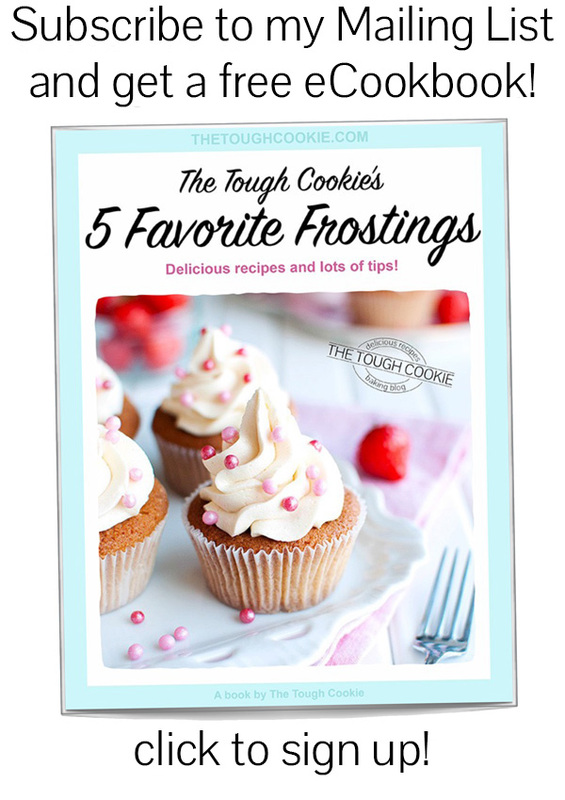 So fruit mousse it is, here in Tough Cookie Land…. As for me, raw eggs don’t bother me in the least. And I have never gotten sick from it, so I encourage you not to worry about it either if you’re healthy. The risk of becoming ill from eating raw eggs is actually very low. However, having said that, it is generally recommended that products made with raw eggs should not be consumed by kids under the age of five, pregnant women, the elderly, or sick people. The last ingredient you’ll need is sugar. That’s it! Only three ingredients that are easy to come by and that you can keep in your pantry/freezer until needed. 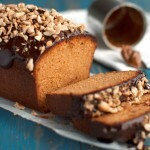 Did I mention that this recipe is perfect for unexpected guests? 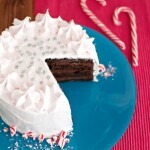 Or, um, perfect if you’re all out of cookies but really need something sweet and delicious right now. Like RIGHT NOW! 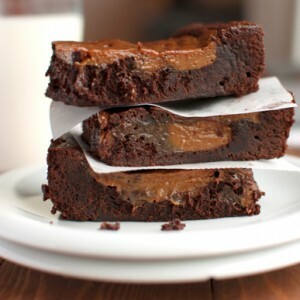 Anyway, you can even make this already fat free, low calorie (low caloric??) 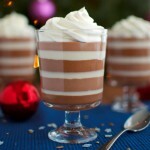 mousse even healthier. Just use a different/less sweetener. Personally, I prefer this mousse with a little sugar in it (about a teaspoon per serving) but you can easily cut back on the sugar or leave the sugar out altogether. 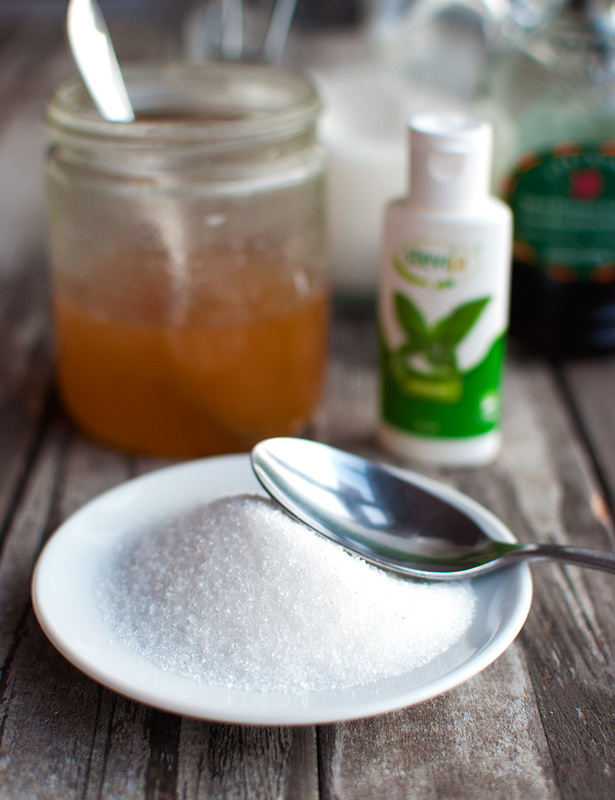 Or replace the sugar with another sweetener, such as honey, maple syrup or even stevia. You can always add more after tasting, right? 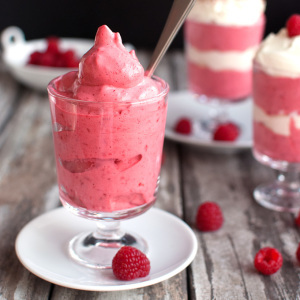 Once you’ve decided on your fruit and sweetener, making this fruity mousse only takes five minutes! 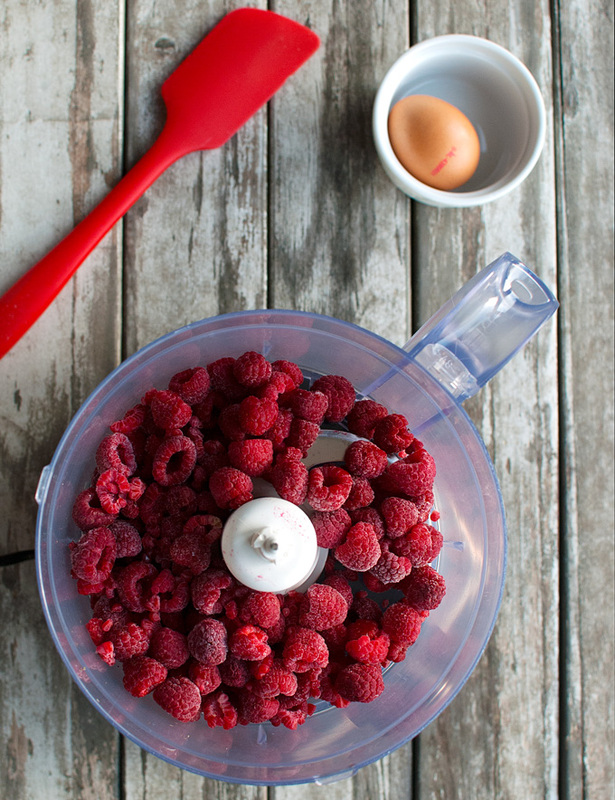 Just start by combining frozen berries and some sugar in the bowl of a food processor. 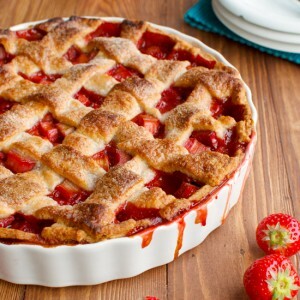 I love to use raspberries in this recipe, but blueberries, strawberries or even frozen mango pieces work great too! Obviously, if you want to use a different sweetener (if any!) you may substitute it for the sugar at this point. Once the fruit puree is relatively (as in: doesn’t have to be completely) smooth, just add an egg white and blitz for about two minutes or until the mixture has dramatically lightened in color and has tripled in volume. Oh, just a little tip: if the blade of your machine does not extend all the way to the sides of the bowl (like mine! 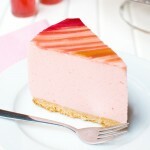 ), the fruit puree may cling to the sides of the bowl of the food processor, rendering the blade useless. 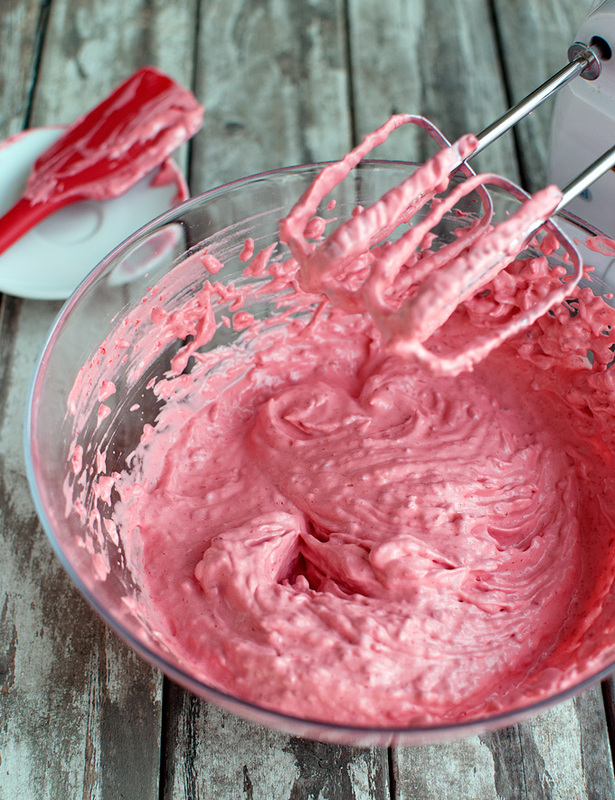 If this happens, just transfer the chunky puree to an ordinary mixing bowl, add the egg white and mix with a normal hand mixer fitted with the whisk attachments until the mousse is fluffy and dreamy and perfect and unicorn-like before transferring the mousse back into the bowl of the food processor again to blitz until completely smooth. And of course, if you can make this recipe healthier by using a different sweetener or omitting the sweetener altogether, this also means you can make this fruit mousse a bit more indulgent by adding different ingredients. 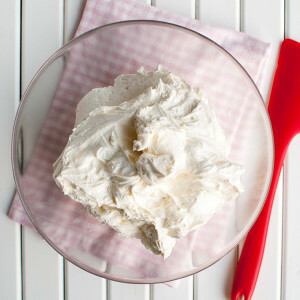 Try adding a dollop of whipped cream, for example. 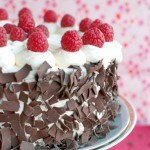 Or chocolate shavings. Or vanilla extract. Or a touch of lemon juice to boost the fruity flavors… It all works! One last thing: because there’s so little sugar in this mousse, it doesn’t keep well. I recommend serving it straight out of the food processor. It keeps for about two hours in the fridge before it starts to collapse. I’ll be making a lot of this stuff this year! 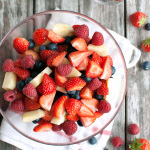 Add fruit to the bowl of a food processor. Blitz to a cold puree. Add the sugar or another sweetener and pulse briefly to combine. If you're using a different sweetener (if any!) taste to see if the puree is sweet enough. Add the egg white and pulse until smooth and fluffy and the mixture has lightened in color and doubled in volume. 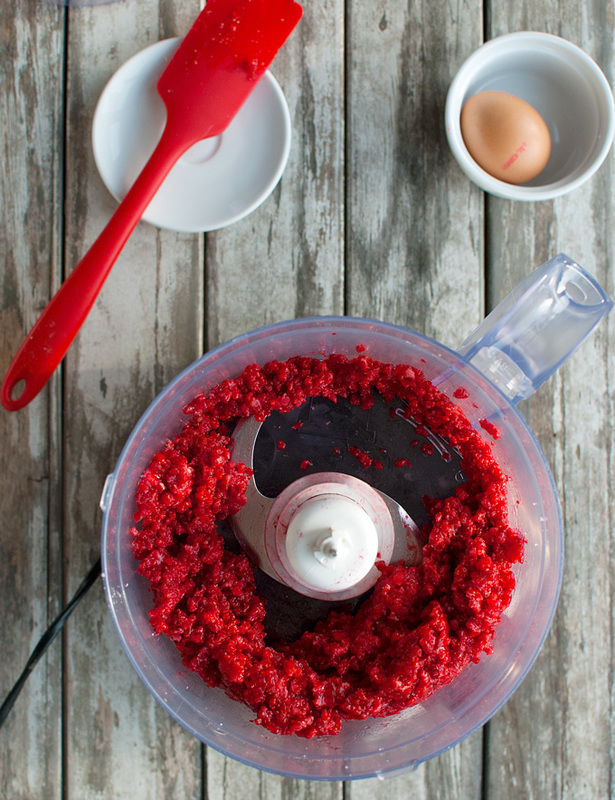 If the mixture clings to the sides of the food processor's bowl too much (this may happen if the blade doesn't extend all the way to the sides of the bowl), transfer the mixture to a normal medium-sized bowl and beat with a mixer fitted with the whisk attachment until fluffy. 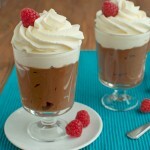 Spoon the mousse into pretty glasses and top with fresh berries and/or whipped cream (optional). Serve immediately or store in the fridge for up to 2 hours. 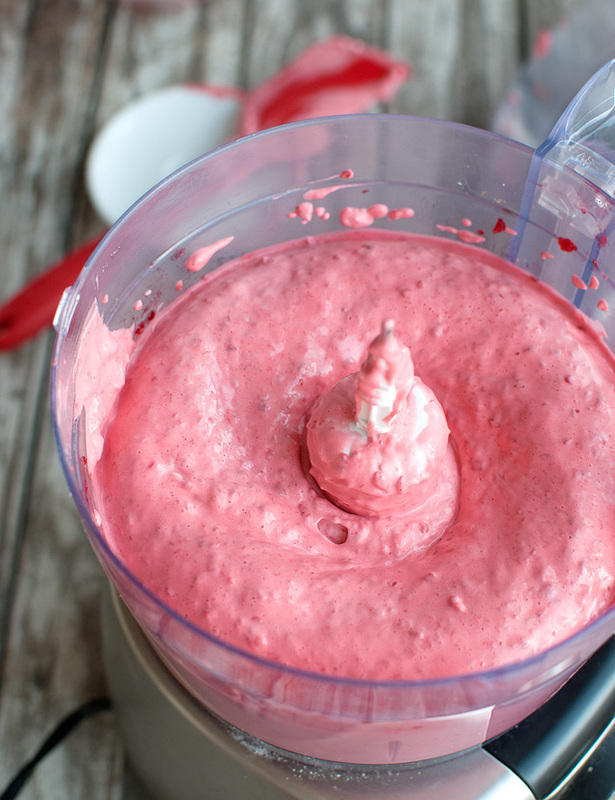 Because this mousse has very little sugar in it, it's not very stable and it won't keep well, so I recommend serving it straight out of the food processor. 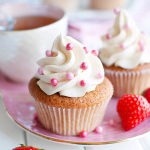 * you can also use another sweetener, such as honey, maple syrup or even stevia. The family enjoyed it. 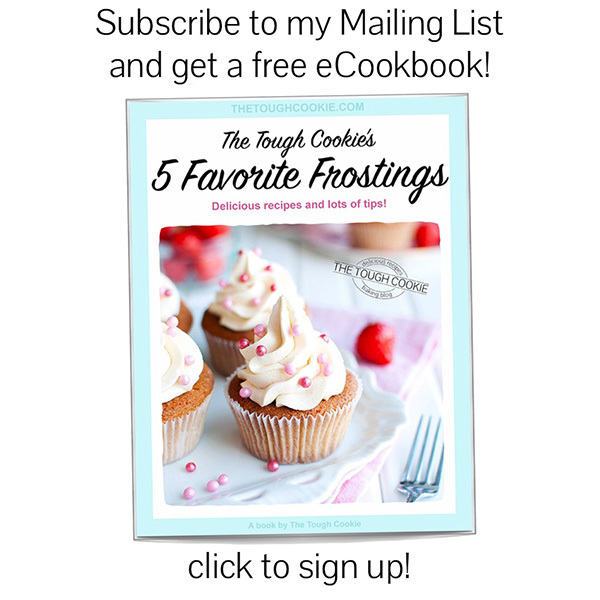 We will be trying more of your recipes soon.